First its location changed. Then the class list dropped a large portion of the classes and became a show for Saddlebreds. And now the name is disappearing, too. The Roanoke Valley Horse Show left the Salem Civic Center for a rebirth at the Virginia Horse Center in 2016. But that rebirth became more of a high-speed evolution. 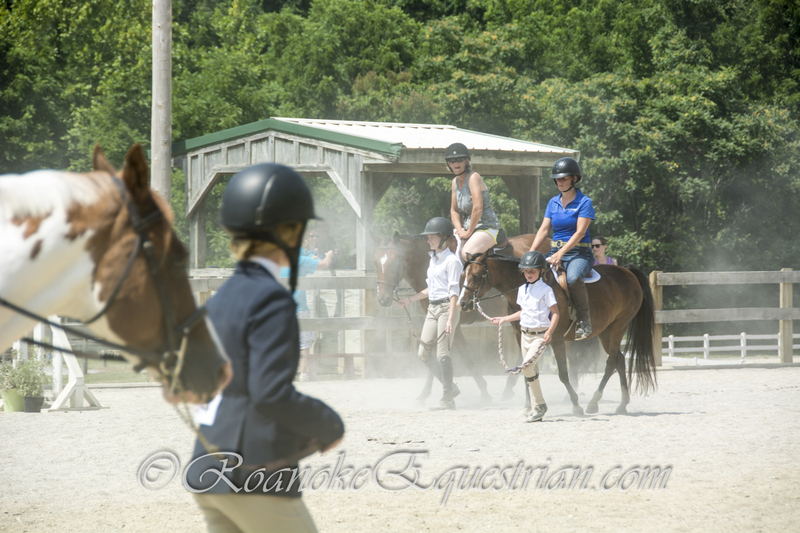 The hunter classes were gone by 2017 and the name had been tweaked to Roanoke Shenandoah Valley Horse Show. A Grand Prix would no longer cap off the weeklong schedule. And the support of Roanoke area businesses also was lost as the Roanoke Valley Horseman’s Association passed off the event to new hosts. This year, the show will run just four days — June 20-23 — at the Virginia Horse Center. And Roanoke appears to be disappearing from its name. The artwork for the show lists it as the Shenandoah Classic Horse Show. Lots has changed but there will still be plenty of high-stepping action if not high jumping action. And it is inevitable that even some of our most treasured horse show events will change over time, particularly as horse shows face the challenge of dropping participation. Meanwhile, the Roanoke Valley Horseman’s Association is scheduled to hold a one-day community horse show at Green Hill Park Equestrian Center in Salem this summer. Watch for more details on that event. Makayla Benjamin, a senior at Sweet Briar College, won the 2018 USEF/Cachionne Cup. Sweet Briar College is back on top. In 2015, college officials shocked alumni and students alike when they announced the school, including its esteemed equestrian program, would close. Alumnae saved their beloved school, and the college’s tradition of riding excellence was saved with it. On Saturday, May 5, 2018, Makayla Benjamin, a senior, became the riding program’s first winner of the Cacchione Cup at the Intercollegiate Horse Shows Association in Harrisburg, Pennsylvania. The USEF/Cacchione Cup is awarded to the National Individual Hunter Seat High Point Rider. Benjamin, of Leesburg, Virginia, is one of 24 riders from across the nation who qualified to compete for the Cacchione Cup, with three riders coming from each of the eight regions across the nation. The last Vixen to compete at nationals in the USEF/Cacchione Cup was Olivia Smith in 2014. Smith placed ninth overall. Benjamin joins Smith and Jodie Weber as Sweet Briar riders to have competed for the USEF/Cacchione Cup since 2006. Weber finished fourth in 2006, while Smith finished 33rd in 2013 and ninth in 2014. The Virginia Tech Hunter Team is making Virginia proud in its first trip to the Intercollegiate Horse Shows Association Nationals, held this year at the Pennsylvania Farm Show Complex in Harrisburg, Pennsylvania. The Nationals, held May 3 to 6, is live streamed on EqSportsNet. Eleven Hokies are in Harrisburg representing Virginia Tech. Four are riding individually and eight are riding as part of the team competition. One rider is competing in both the individual and team categories. Virginia Tech had several riders already seeing success on the first day of competition. Carolyn Rosazza was named Reserve Champion as a team rider in Novice Equitation on the Flat & also receives an honorable mention as an individual in Advanced W/T/C. Rachel Burton placed ninth as an individual in Advanced W/T/C. Tanner Paige Price placed sixth as an individual in Intermediate Equitation Over Fences. Meanwhile, Nichole Jones received an honorable mention as a team rider in Novice Equitation Over Fences. Claire Elise Arnold received an honorable mention as a team rider in Intermediate Equitation on the Flat. IHSA Nationals features 450 men and women from across the U.S. and Canada competing in hunter seat equitation and Western horsemanship in a range of levels from Walk-Trot through Open. The riders have competed throughout the season to qualify and will vie for team, individual, alumni championships and the coveted USEF/Cacchione Cup and the AQHA Western High Point Rider national final. Randolph College in Lynchburg also sent three riders to Nationals. Makayla Benjamin, of Sweet Briar College, is representing Zone 4 in the Cacchione Cup Finals. After the over-fences portion of the competition on Friday morning she was in third place. Hollins University is hiring a Director of Equestrian Program and Head Riding Coach after the retirement of longtime director Nancy Peterson. Peterson arrived at Hollins in 1972. Since then Hollins riders have earned 19 Intercollegiate Horse Shows Association individual national championships, four Fitch Trophy/Cacchione Cup Individual National High Point Rider titles, 21 Old Dominion Athletic Conference titles and two IHSA national team championships. oversight of horse health and a donation program that ensures top quality care and safety. 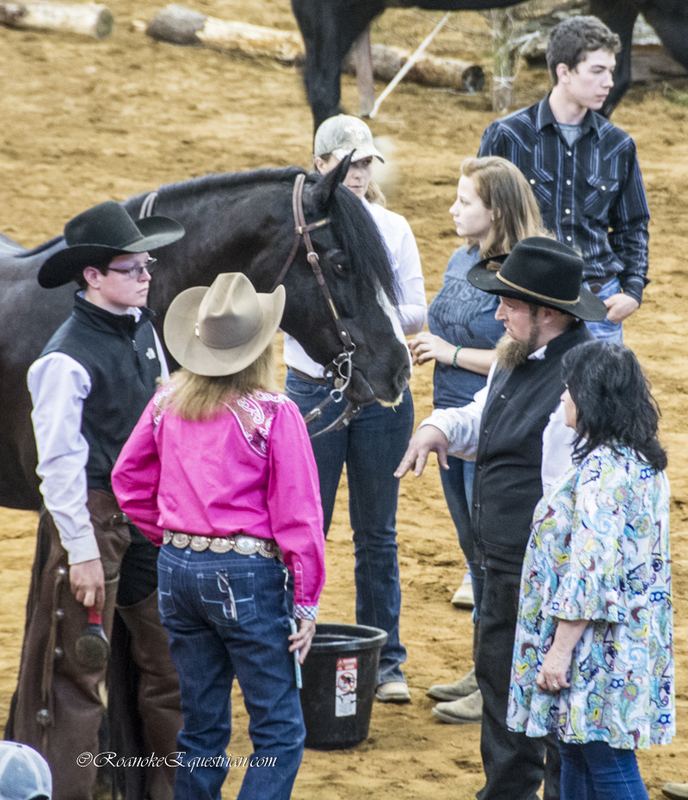 administrative duties related to students and horse show participation and recruitment of student riders working collaboratively with the admissions office. The Great American Ranch and Trail Horse Sale takes place each April at the Virginia Horse Center and along with the auction on Saturday, includes two competitions for sale horses. As the weather warms and the sun starts to feel just a bit warmer, daydreams shift to the promise of another great season of trail riding and hours spent on a favorite horse climbing the Blue Ridge Mountains or cantering along a river at James River State Park. Last weekend (April 13-14, 2018) in Virginia, both fabulous weather and plans for great trail rides converged at the Virginia Horse Center for the Great American Ranch and Trail Horse Sale as 120 horses, hundreds of buyers and even more spectators gathered for another sale. Unique to this sale are the competitions open only to consigned horses. The ranch horses go first on Friday afternoon in a class the requires them to perform an AQHA ranch horse pattern and then box and rope a cow. On Friday evening, another class of horses tackles a trail course that features obstacles such as logs, a bridge, brush, a campsite complete with campfire and a bear, an outhouse in which they must ground tie outside while the rider steps inside and a horse trailer that the horse hops inside. It also often includes a few surprises like a live animal. This year it included a goat along the trail. Horses may only enter one of the competitions. After the Top 10 performers from Friday night came back for the Trail Horse finals on Saturday morning, Steve Meadows of Virginia and Ima Sweet Machine (Hip No. 10) took home the top prize in an especially strong group of finalists. Meadows’ 2008 black gelding then later sold in the sale for $30,000. The Reserve in the trail class went to John Roberts riding Marion G. Valerio’s AQHA gelding Get Your Shine On. He later sold for $11,700. Steve Meadows and Ima Sweet Machine took home the big check in the Trail Horse competition. Get Your Shine on and John Roberts (left) were the Reserve Champion in the Trail Horse competition. 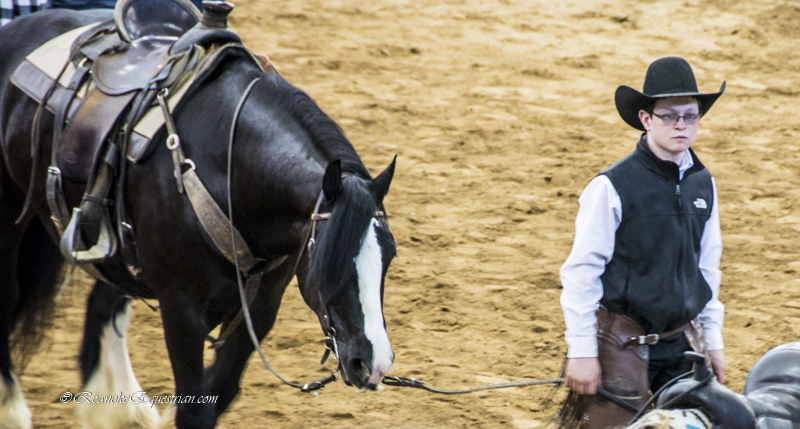 Tanner Keith and Hy Rem Cowboy took home the Ranch Horse title. The ranch horse competition is in just its second year at the sale. The class showcases the working ranch horses and their ability to work cattle. In his first year consigning horses to the sale, Tanner Keith of Virginia had three of the Top 5 horses. Winning the class was Keith’s Hy Rem Cowboy, Hip No. 68. Later in the sale his price did not reach the reserve. Reserve champion was Keith’s RobPaulPayPeter, Hip No. 111. He later sold for $6,600. While many years a champion for the competitions is also the high seller, this year it was pure beauty that took the sale by storm. Hip No. 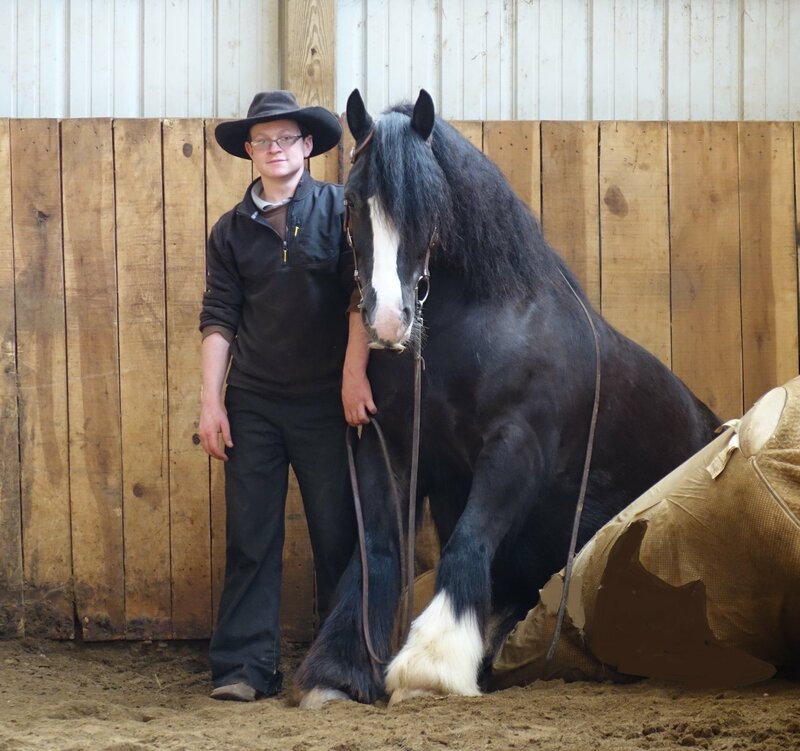 45, GG Jonah, a gorgeous 2008 black Gypsy Vanner gelding consigned by Buckeye Acre Farm of Ohio stirred hearts all across the country before the sale. And it was a series of phone bids that sent his sale price to $40,000, topping this year’s sale. A video of the bidding can be found here. Live videos and photos from the sale are also available for viewing on the sale’s Facebook page. Watch the slideshow below for more photos from around the sale.